The "bride who knew nothing" is back! Five years after her wedding, Jamie Geller is juggling a career and running a busy household - and she still has no time to cook! 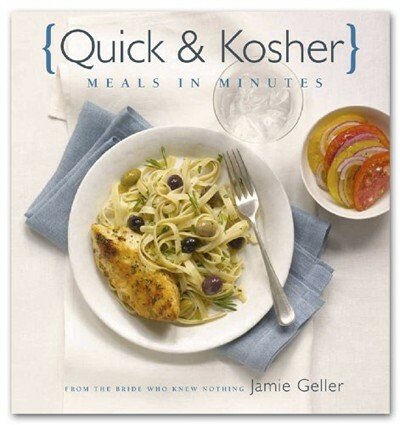 As her family and career rapidly grew, Jamie set out to learn how to cook with children around, how to cook meals that kids would eat (while not boring adult family and guests) and how to do it all without losing her cool. Along the way, she did some thinking about food, children, and why we have both - and she's ready to share. Jamie will help you achieve a "Total Mommy Kitchen" (even if you happen to be a Daddy) by filling your Tool Box with the necessary items and creating a Comfort Zone that will make your kitchen the magnet room in your house. Jamie's homemaking ideas and hilarious anecdotes will enhance your home and lighten your heart. This innovative cookbook features over 215 new quick recipes, new fast takes on traditional holiday dishes, and expert interviews about wine and cheese. Best of all, the recipes in this book tell you how much total time to allow for "PCS" - that's to Prep, Cook & Serve - the full meal. You'll find out how much you can do in just 20, 40, or 60 minutes, and there's a special holiday chapter too! What's more, all the recipes are combined into full, balanced menus, so you'll know that you're serving your family and guests meals that are nourishing, as well as scrumptious and enticing. Jamie's fabulously creative food pairings and exotic interpretations of traditional fare make this cookbook a must-have for your busy kitchen!